Annabelle Lee Lindquist Hickenbottom passed away peacefully at her home in Champaign at 9:40pm on Monday, April 1. She was 97. 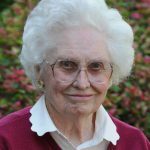 Anne was a lifelong homemaker, devoted wife, mother, grandmother and great-grandmother. Her family was always at the center of her life. Anne was a member of First Presbyterian Church of Champaign, and Carle Philanthropy Women’s Legacy Circle. In lieu of flowers, the family requests memorial donations to either of these organizations. The family would like to express its appreciation to Diversified Healthcare Services for the many years of care they provided so that Anne could stay in her home. A memorial service will take place at First Presbyterian Church Champaign on Saturday, April 13 at 1:30. The family will greet friends following the service. She will be buried in Fairfield, Iowa, next to her beloved Wade. Morgan Memorial Home is in charge of arrangements (www.morganmemorialhome.com). Be the first to share a memory of Anne.